Todays utterly divine human being and I first met on twitter, then we met in real life and now we make space to converse via Skype. 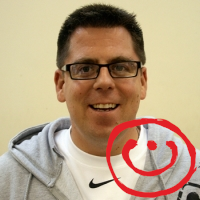 He is a founding member of #YWCHAT and a bit of a legend amongst youth workers. Dan is a 'veteran' youth worker aka experienced, wise, mature, vintage! With a degree from CYM Dan is currently the Youth Worker at his home church in Keynsham where he regularly engages with young people from 11 yrs old and upwards in a whole variety of ways, both inside and outside of his church base. Alongside being a youth worker Dan is studying once again, this time for an MA and has a great focus on the area of youth participation. Ask him about it he is super passionate about it! Dan always has time for people. He is quite selfless at investing in the lives of others and walks what he talks. I really value his input into my life and particularly the wisdom and support he gives me as a female leader. I was very proud of him when he recently became a trustee for Sophia Network! Dan's a reflector, he thinks, he reads, he ponders and asks big questions that most of us wouldn't ask. Some of that gets highlighted on his blog which is well worth spending some time with over a cuppa. That Dan Crouch, he is a good egg!